Racial tensions rise along edges of Idle No More ralliesA new blockade shut down Winnipeg’s busiest artery Wednesday. Portage Ave., the main route to Western Canada, shut down by Idle No more, and the drivers left idling their cars got angry. The man, however, admits he doesn’t know why the people rallying under the Idle No More flag are there. “No, but it doesn’t matter,” he said. His wife leans over and adds her opinion. But the demonstrators would say she’s got things turned around, that it’s Aboriginal people that have let Canadians move in for 300 years. Today, they say, they have become second-class citizens on their own land.And:Like most other peaceful blockades, this one will last only a few hours. However, that hasn’t stopped tensions from rising. A pamphlet with the image of a middle finger and the word “Indian” was handed out at a New Year’s round dance. Meanwhile, Sun News Network held a contest asking people to use one word to describe Attawapiskat Chief Theresa Spence, who is on day 23 of her hunger strike, and win a prize. Some of the words used, included: fat, oink, garbage, chief two-chins and hippo. 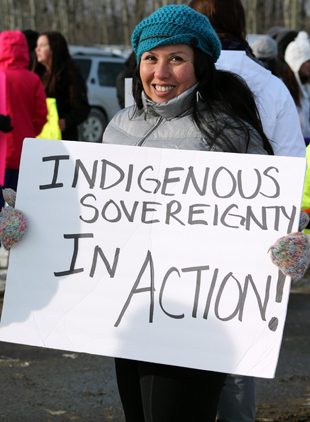 In a media statement issued today, Idle No More states, “On Thursday evening Angela Smith (not her real name to protect her identity) was walking to a store in the city of Thunder Bay, Ontario. Two Caucasian men pulled their car up along side her as she walked on the sidewalk and began issuing racial slurs while throwing items at her from the car. When she continued to walk, the car stopped and the passenger of the vehicle got out of the car and grabbed the woman by her hair and forced her into the back of the car where she was held her down in the back seat by one of them and driven out of the city. “They drove her to a surrounding wooded area where they brutally sexually assaulted, strangled and beat her. During the attack they told her it wasn’t the first time they had committed this type of crime and added, ‘it wouldn’t be the last.’ They also told her ‘You Indians deserve to lose your treaty rights.’ Making a reference to the current peaceful protests being undertaken by First Nations in Thunder Bay and throughout the country under the banner of Idle No More.”Comment: Authorities are investigating this assault as a hate crime. It sure does sound like one. For more on Idle No More, see Idle No More vs. Chiefs and Idle No More Part of Super-Movement.